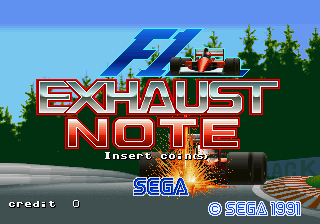 F1 Exhaust Note (Ｆ１エグゾーストノート) is an arcade Formula 1 racing game developed by Sega AM2 for Sega System 32 arcade hardware. It does not have a FIA license, so all the cars and tracks were invented by Sega AM2. The game was distributed as twin cabinets, and was the first arcade game ever to have a special attract screen taking up both monitors show up when neither side of the cabinet was being used. F1 Exhaust Note was bettered by F1 Super Lap, released for the same hardware in 1993. It has never seen a home console release. Main article: F1 Exhaust Note/Magazine articles.